Parade starts at 10:30 after everyone heads to the City Park to enjoy the day festivities'. Location: Stanhope Community Center, 600 Main St. Contact City Office for more information. The Development Group picks things that need done around town and works on them. City wide Trick or Treat. 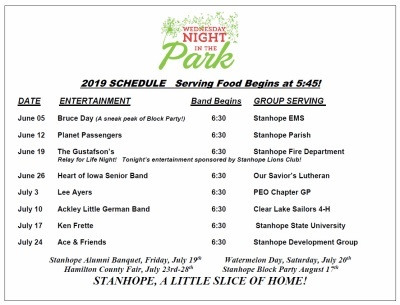 Stanhope Development Group will have food and drinks at Stanhope Community Center, 600 Main St and activities as well. Crafts start: 12:30pm Mr. & Mrs. Clause arrive at 1:00pm on back of fire truck Location: Stanhope Community Center, 600 Main St.
Vote for your favorite Watermelon Day design. You can also vote for your favorites on Stanhope Development Group Facebook page until 1:00 pm. Location: Stanhope Community Center, 600 Main St. Location: The City Maintenance Shed on highway 17 See flyer for details.